Toronto Dogs Directory: Peter Worthington Takes On PETA, And The Organization's Kill Rate - Over 85%!!! 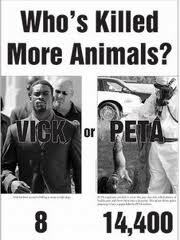 Peter Worthington Takes On PETA, And The Organization's Kill Rate - Over 85%!!! As such it opposes circuses, zoos, farms, pet stores and the like. PETA advertises itself as the largest animal rights organization in the world, with more than three million members and supporters. PETA stages “rescue” operations of abused animals and can serve a useful purpose, which it is exceeding adept at publicizing. What PETA does not tell you is that it doesn’t much like pets — which it sees to view as a form of animal slavery. Nor does it tell you that it euthanizes — kills — some 85% of the animals it rescues. As an organization, it tends to believe an animal is better dead than living with a human being. It claimed PETA’s own official reports, indicate it put to death virtually every dog and cat it took in for adoption. This policy extended from 2006 through 2011. Virginia requires animal shelters to report the number of dogs and cats taken in each year — how many are euthanized and how many are adopted. These statistics are available through Virginia’s Sunshine Law and, as incredible as some may find it, since 1998, of 31,815 animals (mostly dogs and cats) admitted to PETA shelters, only 3,159 were adopted — and 27,751 were killed. That’s 9.7% adoption rate and an 87.2% kill rate — a ghastly record for an organization purporting to work on behalf of animals. What it indicates is a view that if an animal isn’t free and in the wild, it is better off dead.